Sara Armstrong, Ph. D. is an educational consultant, keynote speaker, presenter, and writer working to provide resources and tools for change in education. 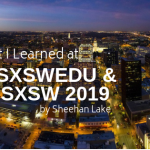 With over 44 years as an educator, Sara has developed and implemented workshops on many topics, including information literacy, storytelling, technology integration, global resources for education, project-based learning, and integrating true social-emotional learning for living. I’ve known and worked with Sara since the 1990’s. In fact, my first educational technology class at Berkeley was from Sara and Flora Russ. Sara and I have been friends and worked together for a long time, and I really wanted to have a conversation with her to share all that she does including her storytelling. Just listen and enjoy. Below are many of the excerpts from the podcast. Sara starts the podcast with a story that has a moral. I have been fortunate to work with Sara over the years and always looked forward to her stories. Her voice is so calming and the stories have deeper meanings that encouraged me to really think and reflect. Most of the stories do. Sara also is actively involved with the Bay Area Storytelling Festival. My dog, Beatrice, a cattle dog mix is very smart and busy. She’s still very active at 8 and very cute. That’s the important thing. She and my husband, Robert, live in Berkeley, CA. I have been in my house in Berkeley, CA a long time and seen lots of changes here. I’m sort of mostly retired now so that means I get to only work on things that I care about. That means working on transforming education and making the systems and processes more meaningful to everybody who is involved. Less stress, more relaxation, and engagement in what people are doing by increasing the possibilities for happiness and flow to take place. 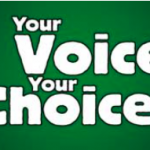 So the way we do that is with project-based learning and giving students voice and choice. I’ve always been fascinated early on by Maria Montessori’s methods and philosophy of education, mainly because little kids were engaged for a long period of time. I took the training and became a Montessori teacher and had my own Montessori elementary school. That was my first, for a long time, my work in education. So that’s what I thought it was always like and should be like. 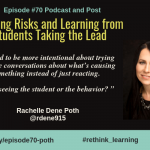 The idea that kids can choose what they want to work on for their own learning. In the preschool, it is really wide open so kids move around here and there in different parts of the classroom focusing on different aspects of education. In the elementary school, it is a little more directed, but again following kids’ interests. So that’s what we do in project-based learning. There’s always something in whatever content we are trying to impart that gives them pathways to what they are interested in. Then the education sticks, and what we want them to learn, they learn. My first year teaching five-year-olds. Kids had a movable alphabet which is letters cut out of wood or plastic and they make words on the rug. This one little guy spent a long time writing on the rug with the movable letters. So he came over and got me and I asked him if he wanted to read it back to me. He said, “No.” The act of creating was what it was all about. Not the communication aspect at that moment. 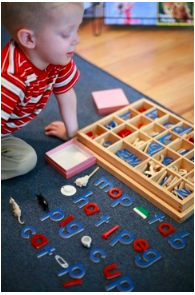 In the Montessori method, we work with writing before reading. 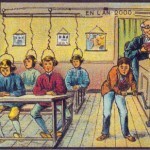 Montessori had K-12 schools. For the upper grades, she had an environment that traditionally was a farm school. The idea for the older kids when their bodies and minds are changing and are interested in other things was to give them skills that they can use when they get into college or the workplace along with their studies. So at the Farm School, the kids took care of the horses and worked in the fields to build capacities. For us today, it probably would be coding or something like that. It was about taking the emphasis off of academic training and into skillsets that kids can use for their lives. 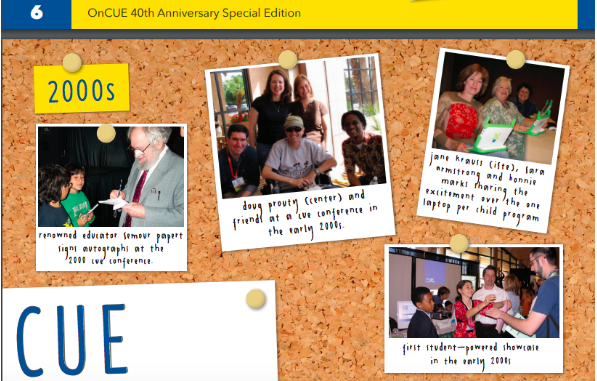 CUE, formally known as Computer Using Educators, just celebrated its 40th anniversary. 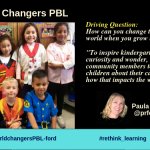 The panel I shared at the CUE Conference was all about the people. For all of us, it was the people early on that we connected and worked together to make sense of technology not for technology’s sake. But because it can do something that kids cannot do ordinarily in other ways. The groups that formed years ago and even yesterday help each other to understand the use of technology and all that is available makes it more interesting, possible, and effective for our students and for us to deepen learning. 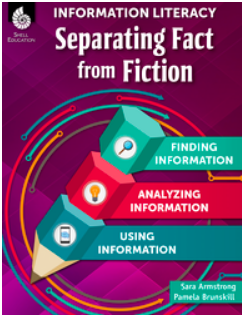 Separating fact from fiction is not new but now more important than ever. Giving kids skills to be able to do that is becoming even more important than it was. We have several processes that work. Obviously, when we first went online and all the information was available, librarians mentioned that they can help people look at websites the same way we vetted books when they came into our libraries. So, we look at the author, relevancy, credentials, timeliness, and so on. But if you are looking at primary sources, relevancy may not apply to today’s world. If you are looking at something personal, that is true may not be as important. There are tools and websites that help with that. The 21st Century Fluency: http://21cif.com/ have wizards that help kids look at different aspects of websites to determine efficacy. There are other groups as well. The idea that kids can have the skills to do that is huge. I’m thinking about a class several years ago with a 5th-grade class that did PowerPoints on some topic they were studying. The last slide said “Thanks to Google!” and that was the way they cited sources. We learned from that that citing sources is important and, hopefully, kids understand that, too. 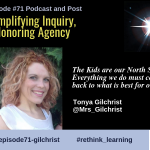 When a kid or anyone does some work, they want to be acknowledged for that work. With Creative Commons, we want people to use our work and pass it on, but we also want to be acknowledged for it. Citing sources is so important. It also gets to the Fact vs. Fiction thing. If you can find what you are looking for by three or more reliable sources, it’s probably true. If not, it might be questionable. We used to worry about folks using Wikimedia exclusively, but as a place to start is not so bad. From there, check the sources they are referring to. We just want kids to understand that it is easy to create a hoax, whether or not it is, or if it is reliable to use and understand. Jason Ohler said, “We need to teach empathy at a young age.” With empathy, we can be critical and understand different perspectives using the 4Cs: critical thinking, communication, collaboration, and creativity. Peter Reynolds added another C: compassion. One of the things I have been working on is helping kids ask good questions to get good answers. The need to be able to do the research to get to the questions that they have. That relates to the information literacy and digital citizenship as well. When you can really get to the questions you are interested in and answer them, the whole enterprise becomes more interesting. The Right Question Institute has a process of brainstorming takes it further to get the terms you use online. The hardest thing for teachers is to identify the driving question. Here the kids identify the driving question and there is a lovely process that takes them through to be able to do that. 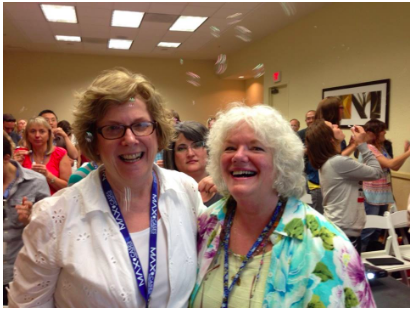 Susan and I do workshops on empathy, gratitude, getting focused, kindness, thinking positively, and movement. We did some of the workshops in Oakland. The one that was most fun was “gratitude.” Just simple things like creating a jar and write on a paper that you are grateful that day. Whenever you can pull out a strip to read what you were grateful for. We invited participants to write thank you notes to someone who needs to be thanked. 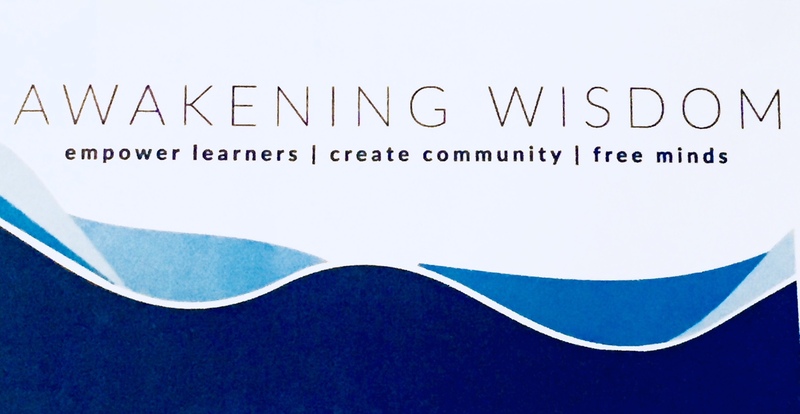 I am on the team that has written the curriculum for Awakening Wisdom, the major project of the Ho’ala Foundation for Education that extends social-emotional learning skills to encompass school climate and affects all stakeholders. 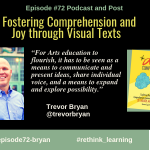 The program dives deeply into the 4 R’s — responsibility, respect, responsiveness, and resourcefulness, and supports administrators, teachers, students, parents, and school community members in their exploration and implementation of these important practices. Sara shared a different pronunciation for the ukelele. In the US, we say “you-ka-lay-lee” and in Hawaii, they pronounce it “ooo-ka-lay-lee.” I forgot and said it the US way in the podcast. Now I have to get myself a ukelele and learn how to play. I really enjoyed this conversation with Sara who has been a long-time friend. 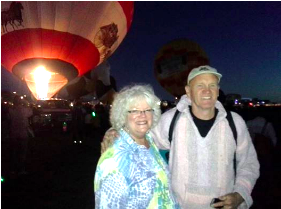 I’m always surprised about all she does and hope to do more work with her with Awakening Wisdom. Sara Armstrong, Ph. D. is an educational consultant, keynote speaker, presenter, and writer working to provide resources and tools for change in education. With over 44 years as an educator, Sara Armstrong has developed and implemented workshops on many topics, including information literacy, digital storytelling, technology integration, global resources for education, and project-based learning. 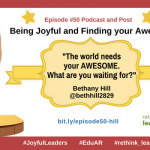 A current focus on wellness and increasing happiness and well-being contribute to joyful learning for teachers and students. Sara holds two B.A.s—one in English from California State University, Los Angeles, and one in psychology from California State University, Sonoma. She completed her work for a California credential, a Master’s program in leadership and reading, and a Ph.D. in the philosophy of education at the University of California, Berkeley. 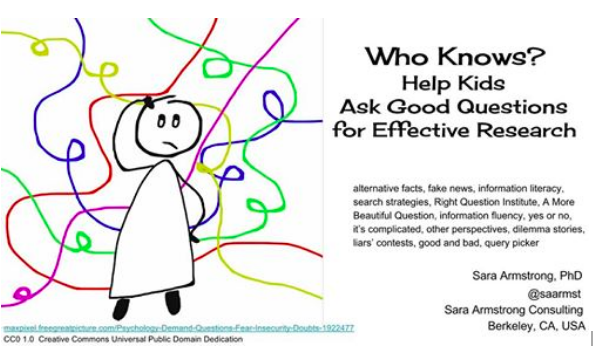 Sara is a published writer and offers presentations through a variety of venues including keynote addresses, conference sessions, specialized workshops for conferences, or ongoing professional development at a variety of educational venues. Sara’s work naturally evolved into a passion for project-based learning. Sara has conducted sessions at many conferences from one hour to several days to a year-long contract helping teachers understand and develop meaningful inquiry-based projects. Over her 44 years as an educator, Sara Armstrong has developed and implemented workshops on many topics, including information literacy, digital storytelling, technology integration, global resources for education and project-based learning. Armstrong has also written technology grant proposals and helped others “groom” their plans. She was the editor of OnCUE, Computer-Using Educator’s journal, and has been the proofreader for Bark! and Storyline magazines. She currently edits The Voice, the newsletter for the Oakland-Piedmont branch of AAUW and is writing the curriculum for Awakening Wisdom, the major project of Ho’ala Foundation. Sara is an Associate of the Thornburg Center for Professional Development and serves on the Board of Directors of the Global SchoolNet Foundation, the Center for Accessible Technology, as well as Berkeley High School’s Community Partnership Academy and the Ho’ala Foundation for Education Board of Directors. She is a recipient of both of CUE’s highest honors: a Gold Disk and a Platinum Disk.